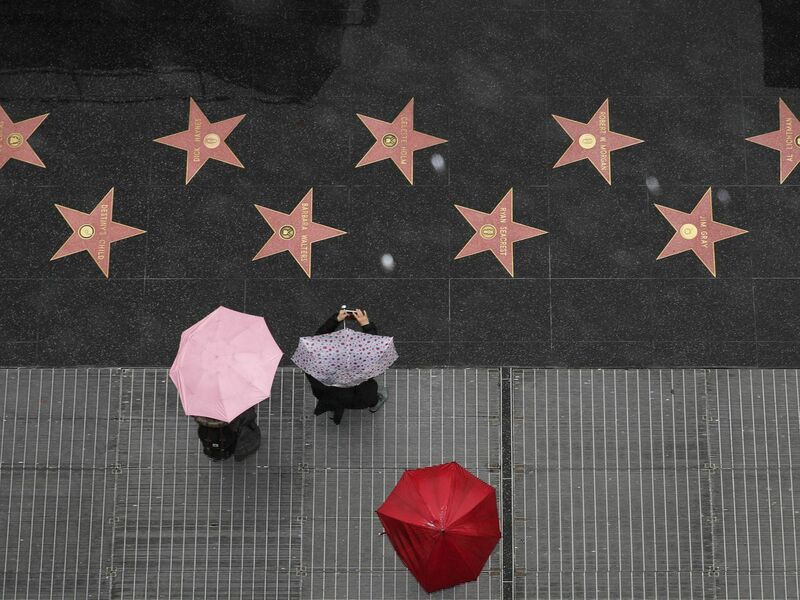 A second consecutive month of above-average rainfall may be in store for Los Angeles, where more than 3 inches of rain have already fallen in February. The region will get another soaking later this week, with up to 2 inches of rain expected Wednesday and Thursday, according to a National Weather Service forecast. Southern California’s already snow-capped peaks could get even more precipitation—between 2 and 4 inches—than coastal areas, the forecast says. It’s already rained more days than not in February, and the monthly precipitation total of 3.08 inches is just under the historical average of 3.21 inches. That’s still a long way from the wettest February on record: In 1998, 13.68 inches fell on Downtown Los Angeles. Still, recent showers are putting Los Angeles on track to surpass its calendar-year rainfall average for the first time since 2010. In less than two months, the city has already gotten 9.03 inches of rainfall, more than 60 percent of the yearly average. Los Angeles is also coming off a string of dry water years, which begin in October rather than January. Since the decade began, only two water years have seen above-average rainfall. In the current water year, 13.29 inches of rain have fallen in Downtown LA. That’s nearly 5 inches above the normal level of precipitation at this point in the 12-month water calendar. During the same period last year, just 1.77 inches of rain fell in Downtown LA. More wet weather also bodes well for those awaiting wildflower blooms in Southern California. Though most of the region’s dormant flowers won’t burst into bloom until early spring, cool damp conditions in the winter months are a key indicator that explosions of color across LA’s meadows and hillsides will be particularly intense when warmer weather arrives.